The process of removing unwanted tattoos could possibly be as old the process of applying them. Although most medical professionals agree that laser treatment is the most effective and least evasive way to remove tattoo ink, it is not the only method available. Before laser tattoo removal became readily available, techniques for tattoo removal were limited to areas of the epidermis, or primary skin layer. 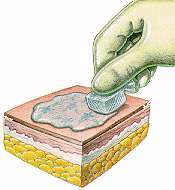 By dealing strictly with this layer of the skin, procedures like excision or dermabrasion were the only alternatives. Today, with the internet, dozens of “tattoo removal creams” have popped up promising tattoo removal miracles by applying their unregulated creams directly to the skin. Before making any decisions regarding tattoo removal, make sure to be aware of all of your options regarding your tattoo. Dermabrasion involves the process of sloughing away the top layers of skin to remove the pigment and skin effected and encourage new skin to grow. It can be done with sandpaper, caustic acids or salt – this is sometimes called salibrasion, or a rapidly rotating brush. Local anesthetic is generally applied before the skin is abraded, and it may take several days to heal and feel better. It is not recommended for tattoos on faces, tattoos that may have ink injected into the subcutaneous fat (which occurs with tattoo given by non-professionals), or older tattoos as their pigments may have migrated deeper into the skin and be harder to rub off. Scarring – sometimes more extensive than the tattoo that is removed. A raised or thickened scar can appear three to six months after the tattoo removal. Pain – it may even be more painful than the original tattoo was. Skin discoloration – because of damage at the site of the removal. Infection – which can delay healing and increase your risk of scarring. Surgical Excision is the process of using a scalpel and cutting away a portion of one’s skin to remove a tattoo. Once the area has been removed the wound is then sutured. This process is done by a surgeon and is only recommended on smaller tattoos. One good thing about this older way of removal is that it is immediate but unfortunately it also has a high rate of scarring. Sometimes skin graphs may be needed for larger tattoos. 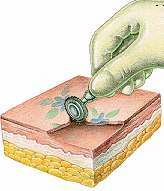 is a very old method of abrasion where the treatment area is literally rubbed with salt. This procedure is probably one of the oldest resurfacing techniques known. This procedure is performed under local anesthetic. Cryosurgery is known as the “freezing” method of tattoo removal where liquid nitrogen is applied to the tattooed area. After the nitrogen is applied, a specific light is used to induce a peeling of the skin. This way of tattoo removal is done gradually, in a series of doctor visits. Side effects include bleeding at the freeze site, blistering, edema and pain. Some patients report not being able to generate new hair at the surgery site. Some reports also point to these creams as possibly having a cancer developing ingredient called Hydroquinone in them. These new findings have already made other countries like Japan, France , and England ban all skin care products containing Hydroquinone. If you are using a tattoo removal cream make sure to check the label or packaging to assure it does not contain Hydroquinone. Chemical peels are skin rejuvenation treatments performed by dermatologists for wrinkles, fine lines, age spots, and minor skin discolorations. T.C.A or tricholoaetic acid is the most widely used version of these acids. These chemical peels use acids that are applied directly to the skin for up to ten minutes then neutralized with frozen saline packs. Before being treated, patients have to apply skin conditioners like Retin-A for up to a month prior to getting the first treatment. This conditioner reduces the dead layers of skin so the peel can work into the deeper layers of skin for the best results. Most dermatologists that offer this procedure do not use it for tattoo removal simply because it does not go as deep enough to be effective. There are some companies on the internet that offer these types of acids for people to apply at home without the care of a professional. These creams are not recommended or regulated by the F.D.A and should be reconsidered as safe methods of tattoo removal. If they were effective, dermatologists would offer them for tattoo removal clients at their respective offices. Furthermore, if they were applied in a manner that would be deep enough to target tattoo pigment; they would have to negate safety, which could lead to infection and or scarring. using chemicals directly to the skin like Drano and other abrasive cleaners found under the kitchen sink. burning the tattoo with lighters, cigarette butts, and matches. cutting out the tattoo with knives, razors, or even office scissors. using sandpaper, electric grinders and sanders to file the tattoo down or off. HOME TATTOO REMOVAL TECHNIQUES ARE VERY DANGEROUS AND SHOULD NOT BE ATTEMPTED!! *avoid trying to remove an unwanted tattoo yourself. You can run a serious risk of infection and unnecessary scarring when trying to do so. Also, once a tattoo is scarred from trying to remove it yourself, it will make it even harder for a professional to do so. Tattoo removal can now be done by professionals at very affordable rates in most major cities nationwide. Intense Pulsed Light therapy or I.P.L. is sometimes categorized with laser therapy because they both use light to brake down tattoo ink in the body. I.P.L. therapy is very effective in reducing tattoo ink pigment and is similar to laser therapy although much more expensive. Most providers charge about $10 per pulse and unfortunately not everyone is a good candidate for this procedure. If you are darkly tanned, or do not react well to burns, the Intense Pulsed Light Therapy method may not be suited to you. Also, people with darker skin tones are at a greater risk of Hypopigmentation (loss of proper skin color) with this procedure. This laser is the first of its kind to be used for tattoo removal. The Q-switched ruby laser emits short pulses of intense red light which passes harmlessly through normal skin where it is selectively absorbed by the tattoo ink. The laser energy breaks the tattoo ink into minute particles that are easily removed by your body’s immune system. Any large particles of ink that are not completely fragmented may require additional treatments, but the tattoo gradually fades. Normal skin is not harmed by the treatment. Only the ink is removed, and your skin is left intact. This laser was the first step to what is now being used for modern laser tattoo removal. This laser uses a 755nm wavelength for targeting tattoo ink. The Alexandrite crystal emits energy that is longer than the Ruby at 694nm and significantly shorter than the ND-YAG laser at 1064nm. Excellent results have been obtained in the treatment of blue-black and green tattoos using this laser. Unfortunately, perhaps because of it’s inferior construction (the Alexandrite is made with a crystal that doesn’t tolerate laser impacts well) some of these lasers are not consistent or reliable. Another factor to consider is this laser is not recommended for red tattoos, which is the second most popular pigment color for tattoos. This laser is effective for both amateur and professional tattoos of all colors. Like the ruby laser, the Q-switched Nd:YAG is most effective for black tattoos. This laser has the advantage of being useful for darker skinned individuals. At the frequency doubled setting (532 nm), the Q-switched Nd:YAG is highly effective for treating red and orange tattoos. With this laser, providers can now target multiple colors with the same laser making colorful tattoos removable. The versatility of this laser is why it is considered the most effective laser in the industry. A tattoo cover-up is when a new tattoo is applied directly over the original unwanted tattoo. The process is not going to do anything but camouflage the original tattoo but most people are pleased with the results. Tattoo cover-ups are best done in addition to laser treatments. The laser treatments are performed before the new tattoo is applied. These laser treatments are performed to lighten the original tattoo so the tattoo artist has a better “canvas” to work with. On average, it only takes 1-3 treatments to lighten a tattoo for a cover-up tattoo. This process is cheaper that complete removal, giving another option to people with tattoo regret.